People are being encouraged to think about food hygiene as the warm weather continues and thoughts turn to al fresco eating. Durham County Council is supporting Food Safety Week, which starts today (Monday, 19 June), by offering advice on banishing the risk at barbecues and playing it safe with picnics. The UK has an estimated 1 million cases of food poisoning every year and the risk of foodborne illness rises over the summer months, when the temperature picks up and more people enjoy eating outdoors. New research from the Food Standards Agency (FSA) shows that 19 per cent of people admit to eating rare burgers some of the time – a risk as rare beef burgers are three times more likely to contain harmful E.coli than burgers that are well-cooked. Furthermore, while 22 per cent of people worry about food going off in the sun, one in ten often leave picnic food out for more than two hours in the summer. • Food should be defrosted fully in the fridge – not at room temperature. • Cooked foods should be cooled at room temperature and then placed in the fridge within one to two hours. • At barbecues and picnics, cold fresh food should be kept in a fridge or cool box until serving time. • Always check that meat is steaming hot, with no pink meat visible and that juices run clear before serving. • Burgers should not be served rare or pink as harmful bacteria may be present in the middle of the burger. • Once served, dishes should not sit out for longer than two hours, or one hour if it is very hot outside. • Wash your hands thoroughly before cooking and eating. 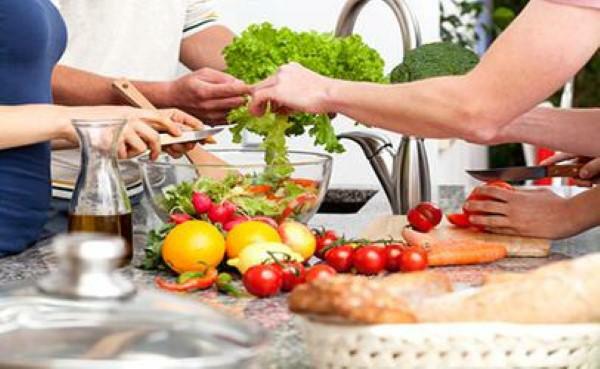 • Utensils used to prepare raw foods should be kept separate to those used on ready to eat dishes. • Don’t wash raw chicken or any other meat; it could splash germs onto your hands, clothes, utensils and worktops. Thorough cooking will kill any bacteria present. • Store raw meat separately from ready-to-eat foods. • Wash your hands after touching raw meat and before you handle ready-to-eat food. • Do not prepare food for others if you are unwell. Michael Yeadon, Durham County Council’s health protection manager, said: “Summer is the perfect time to enjoy eating outside with family and friends and this advice will help people to do that safely. “Following simple steps to make sure food is stored and cooked properly can help to prevent food poisoning and make sure your summer is a success.